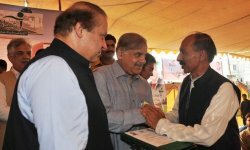 LAHORE: Punjab Chief Minister (CM) Shahbaz Sharif has said that Pakistan Muslim League-Nawaz (PML-N) has not only realised the dream of Nawaz Sharif by providing houses to the poor, labourers, widows and deprived persons under Ashiana Housing Scheme (AHS) but also translated the vision of Quaid-e-Azam and Allama Iqbal into reality. He said this on Tuesday while addressing a ceremony for the distribution of allotment letters to the lucky recipients of houses allotted through transparent balloting in the first AHS at Soraba Atari. The CM said that by providing shelter to the shelter-less, a feeling of contentment had been promoted among them and they were made to feel that they were equal citizens of this country. PML-N chief Nawaz Sharif was the chief guest of the event. Senior Adviser Sardar Zulfiqar Ali Khan Khosa, Senator Pervaiz Rashid, Muslim League leaders Zafar Iqbal Jhagra, Mashahidullah Khan, members of national and provincial assemblies, provincial ministers, columnists, intellectuals and a large number of people were also present on the occasion. Addressing the audience, the CM said that Quaid-e-Azam had given the message of hard work and acting upon his principle, the AHS project had been completed by working round-the-clock. He said that the forefathers of the country envisioned a dream on March 23, 1940, which was realised in 1947 after an epic struggle under the leadership of Quaid-e-Azam. Meanwhile, Nawaz Sharif, while addressing the audience, said that the provision of shelter to the homeless was a big achievement of the PML-N and Shahbaz Sharif, adding that the project would be extended to other districts as well and a time will come when every Pakistani will have his own house. “The nation is divided into two classes. On one hand there are people who sit in their offices, just put one signature on files and get a house from national exchequer while on the other hand, there are workers, labourers, cultivators and marginalised persons who do not even have a two-marla house,” Nawaz Sharif said. It was the responsibility of the state to safeguard the rights of the poor, he said, adding that the PML-N started welfare projects for the poor people during each tenure. He said that a project had been started for the provision of five lakh houses under Mera Ghar Scheme, adding, “However, Musharraf, after coming into power, immediately sold all the plots at a throwaway price and was not even held accountable for the deed.” In addition to the Mera Ghar Scheme, lands were also distributed among landless cultivators in Sindh, Punjab and Khyber Pakhtunkhwa while proprietary rights were granted to thousands of dwellers of kachi abadies, he said. Yellow cabs were also distributed during this period and the same welfare projects are still continuing in Punjab, he said. “We will safeguard the rights of the people and will even go to the extent of a long march for the purpose if needed,” said Nawaz Sharif, adding that the country was “not a property of few but home to 18 crore people”. He said that rights would be granted to the people at their doorstep. The promise made to the people on August 14 will be honoured and destiny of Pakistan will be changed through collective efforts, he added. The time will come when Pakistan will become a prosperous country and every effort will be made to achieve this goal at the earliest, he concluded.